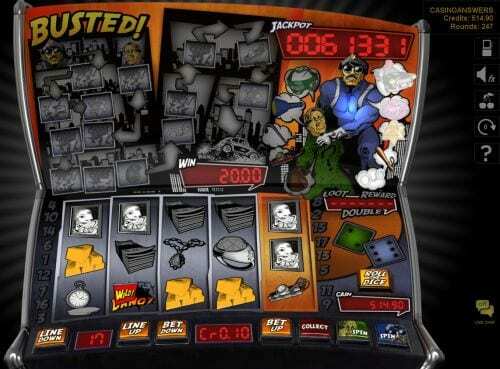 Welcome to the Busted slots review and no deposit casino bonus codes. In this review, we tell readers the pros and cons of playing Busted slots at Slotland and WinADay casino. Also, we have amazing videos with in-depth descriptions and tips to help you win money and Bitcoins. Slotland casino gaming software powers this video slot machine. Sign up for Slotland or WinADay casino through PlaySlots4RealMoney.com. As a result, claim exclusive no deposit casino bonus codes and above average welcome bonus promotions. Most importantly, the Busted slot machine has five reels with seventeen pay lines. Also, the online slot machine features a progressive jackpot, bonus rounds, stacked wilds, free spins, and a gamble feature. Do you like to play online slot machines with Cops and Robbers themes? If you do, Busted slots may be a good fit for you! Read the article Slotland Casino Launches A Penny Slot Machine With A Progressive Jackpot! The Busted slot machine has great three dimensional graphics. Above all, play this electronic gambling machine with a few cents. Also, enjoy gambling on this video slot game for high stakes. Indeed, the symbols in the Busted slot machine are creative. Above all, enjoy watching the Safe, Gold Bars, Painting, Cash, Vase, and the necklace. Also, keep your eyes open for the Police Car, Doughnut, Badge, Gun, Double, Pocket, Ring, Mask, Crowbar, Explosives, Sack Robber symbols and the billy club. The Gun is the wild symbol. Score a gun after spinning the reels. As a result, your winning combinations will replace your old symbols. The wild gun symbol replaces every icon except the Double image. Most importantly, the Double is the bonus symbol. Look at the pay table when you are playing Busted slots online for real money. How Is The Real Money Betting Range? To be upfront, the real money betting range is decent. High rollers can find higher limit slot machines to play. However, Busted slots offer the best of both worlds. The coin denominations start with one penny. Also, you can wager up to four dollars on seventeen pay lines. As a result, the most you can bet per spin is sixty-eight dollars. How Can I Win The Progressive Jackpot Playing Busted Slots Online?